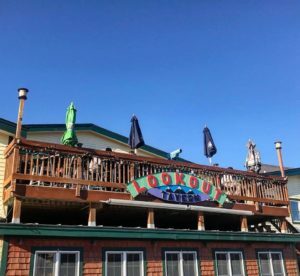 While the building that currently houses the Lookout Tavern started as the Killington Resort’s 1st “Ski Lodge” in 1958, the Lookout Tavern itself started with Phil and Joy in 2000. Phil and Joy Black were a husband and wife living in the Killington community that had dedicated their lives to giving great service to Killington’s skiers and riders. Having worked in the Killington restaurant scene for over a decade, they both saw they need for a simple and fun “burger and beer” joint on the Access Road. The space they chose had been the home to over 13 different failed pubs, restaurants, and even a “club” that was opened exclusively for “gentlemen” but they knew as the first stop off the mountain this would be the perfect spot for the Lookout! Things started in August 2000 with hammers, nails, elbow grease and an extensive renovation of the building and grounds… 60 days later they kicked things off with the 1st Annual Basin Blast-Off Party as Mac & Jamie took the stage and played to an over-flowing crowd. It didn’t take everyone long to know that the Lookout was different and would be here in Killington for a very long time. With a simple formula (great people, delicious food, cold drinks and a friendly and welcoming atmosphere) the Lookout continues to grow, and we are expanding our dining area this winter so even people can be part of the good times. As for the name “The Lookout”? You’d think it was because of the amazing view we have of the mountain from our rooftop deck, but it actually has to do with an ugly necktie… Ask Phil to tell you the story, it’s a good one! Today, in addition to the Lookout Tavern, the building is home to Killington's famous Basin Sports and Effie Dudley. Now that you know our story, Take a look at our menu. We have a delicious 40 item menu, with plenty of tasty menu items. We also have an excellent drink menu to choose from with a variety of craft beers and drinks.